The Samsung Galaxy A50 is a mid-range smartphone with a premium design, Super AMOLED screen, an in-display fingerprint reader, a triple camera, and a large battery. The phone features a 6.4-inch Super AMOLED screen with Full HD+ resolution, 19.5:9 aspect ratio, and a U-shaped notch. It features a 25MP selfie camera with f/2.0 aperture. There is a triple-camera setup at the rear, which consists of a 25MP sensor, an 8MP sensor, and a 5MP sensor, can record 4K videos. There is a 25MP selfie camera at the front. 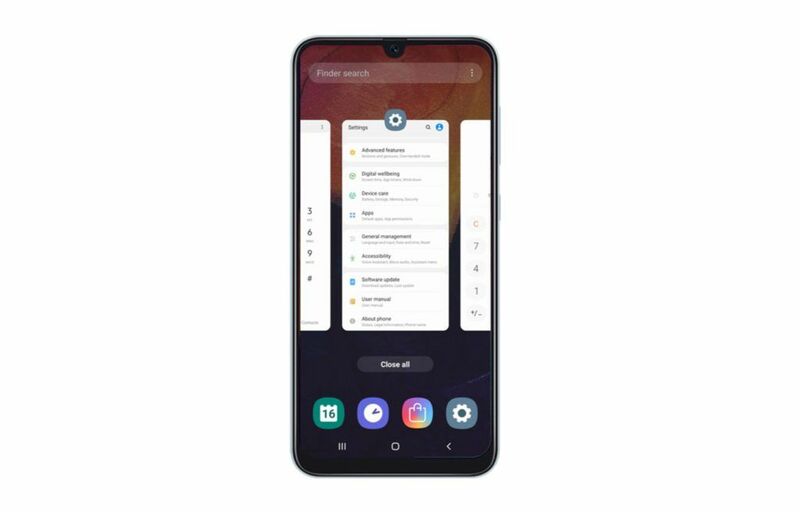 The Galaxy A50 runs Android 9 Pie-based One UI and uses the Exynos 9610 chipset. The phone has GPS, a dual-SIM card slot, 4G connectivity, dual-band Wi-Fi ac/b/g/n, Bluetooth 5.0, NFC, a USB Type-C port, and a 3.5mm headphone jack. It lasts long, too, thanks to a 4000mAh battery which supports 15W fast charging. Pros: The A50 has a great AMOLED screen. Impressive imaging is possible in favorable lighting conditions. Gaming at high graphics settings is indeed possible. Samsung has designed One UI quite well. 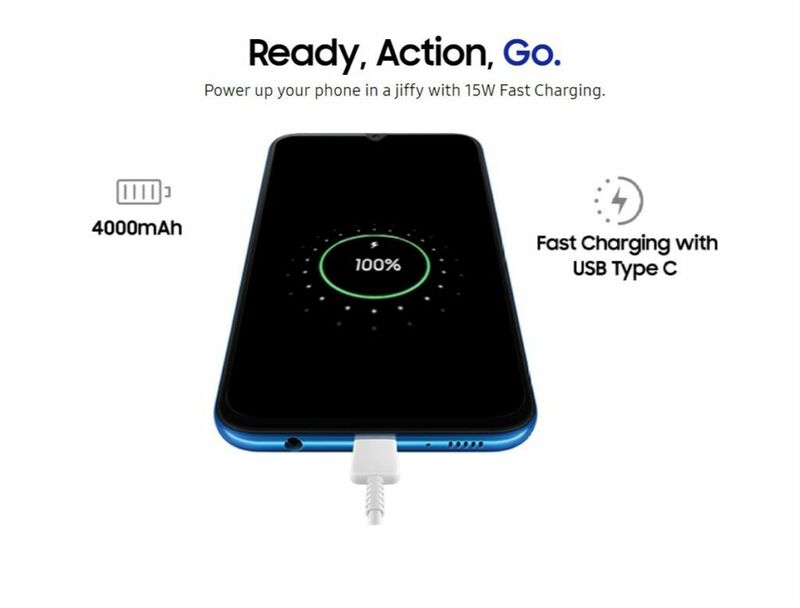 The phone also offers USB Type-C fast charging with decent battery life. Cons: Unfortunately, the phone's in-display fingerprint scanner performance is terrible. Furthermore, usability is hampered because of intermittent lag and stutters in the UI. Imaging in low-light is poor. Also, the rear panel of the phone can be scratched easily. Summary: The Galaxy A50 offers some impressive features including a superb AMOLED screen, great battery life, and cameras that are capable of impressive photography. However, the phone faulters in key aspects such as its inconsistent in-display fingerprint sensor and overall sluggishness, making it difficult to use the phone as a daily driver. The Samsung Galaxy A50 price in India is Rs 19,990 for the 4GB + 64GB internal storage variant. The phone is available in 2 variants: Blue, . The phone was launched in India on 30 March 2019. The Samsung Galaxy A50 uses a 6.4-inch Super AMOLED screen and Samsung calls it Infinity U display due to its U-shaped notch. The screen features Full HD+ resolution (2340×1080 pixels) and 19.5:9 aspect ratio. The Galaxy A50 is also the first mid-range smartphone from Samsung to feature an in-display fingerprint reader. The phone uses an optical in-display fingerprint reader rather than the ultrasonic in-display fingerprint reader that’s used in the Galaxy S10 and the Galaxy S10 Plus. The phone is available in three colors in India: Black, Blue, and White. The company’s first mid-range phone to use a triple-camera setup is the Galaxy A50, bringing it in line with many other high-end phones from 2019. The triple-camera setup includes a 25MP sensor (f/1.7 aperture, PDAF) with a wide-angle lens, an 8MP sensor (f/2.2 aperture) with an ultra-wide angle lens, and a 5MP (f/2.2 aperture) depth sensor. There’s an LED flash The rear-facing camera can also record 2160p 4K UHD and 1080p Full HD videos at 30fps. At the front, the U-shaped notch hides within a 25MP selfie camera that has f/2.0 aperture and can record 1080p Full HD videos at 30fps. 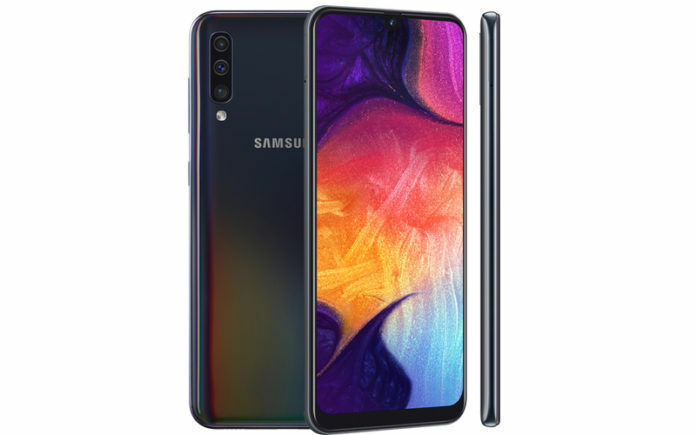 The Samsung Galaxy A50 is powered by Samsung’s mid-range Exynos 9610 chipset. Announced in March this year, the Exynos 9610 is manufactured on a 10nm FinFET process. It has four ARM Cortex-A73 cores clocked at up to 2.3 GHz and four ARM Cortex-A53 cores clocked at 1.7 GHz. The graphics are processed by Mali-G72 MP3 GPU. The chipset is good enough for a mid-range device. The phones is available in two memory configurations: 4GB RAM + 64GB storage and 6GB RAM + 64GB storage. There’s a microSD card slot as well. On the software front, the Galaxy A50 ships with the latest Android 9 Pie operating system that’s customized with Samsung’s One UI design. The Galaxy A50 comes packed with a high-capacity battery. At 4000mAh, expect the phone to easily last a day even with heavy usage. 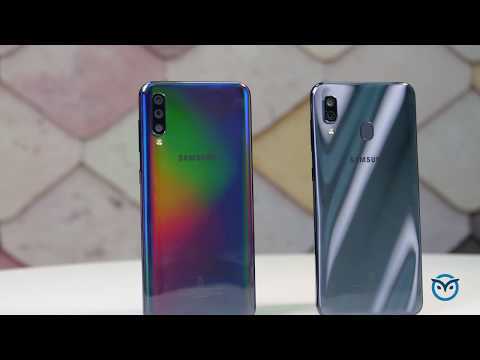 Connectivity options on the Galaxy A50 include GPS with A-GPS, GLONASS, BeiDou, dual-SIM card slot with 4G LTE, Wi-Fi 802.11 a/b/g/n/ac (2.4Ghz and 5GHz), Bluetooth 5.0 (with LE), USB 2.0 Type-C port, and a 3.5mm headphone jack. Useful phone at an affordable price.